Morse returned home from war in 1918 and headed for New York City, the hottest place on the planet, where he would emerge as an artist whose works would remain largely anonymous through the years but whose impact would be indelibly imprinted on the nightclub circuit. 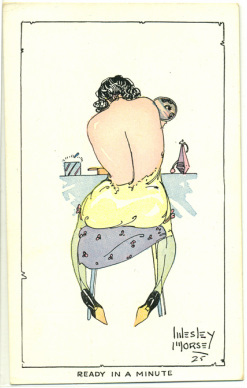 Living and working alongside cartoonist Chic Young, he created flapper strips for the Hearst syndicate, pin-ups, comic strip ads for Colliers, and a strip called Beau Gus for Circuis: The Comic Riot. At night he could be found at speakeasies like the Hotsy Totsy and El Fey, and later, with the repeal of Prohibition, at the high society clubs the French Casino, the Stork Club and El Morocco. In 1921 Morse was living at the Hotel Des Artists, an artists' co-op, sort of the Algonquin of the New York art world. As the new kid on the block, he was looking for action. He found it with the Ziegfeld Follies. His first known commercial endeavors were drawing and painting some of Ziegfeld's best-known beauties, women like Allyn King and Mary Eaton. 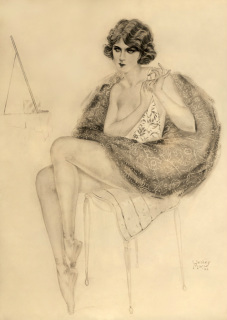 The writer H.C. Witwer dubbed him "the greatest pretty girl artist on Broadway" for his work glorifyng the American girl for the Ziegfeld Follies.